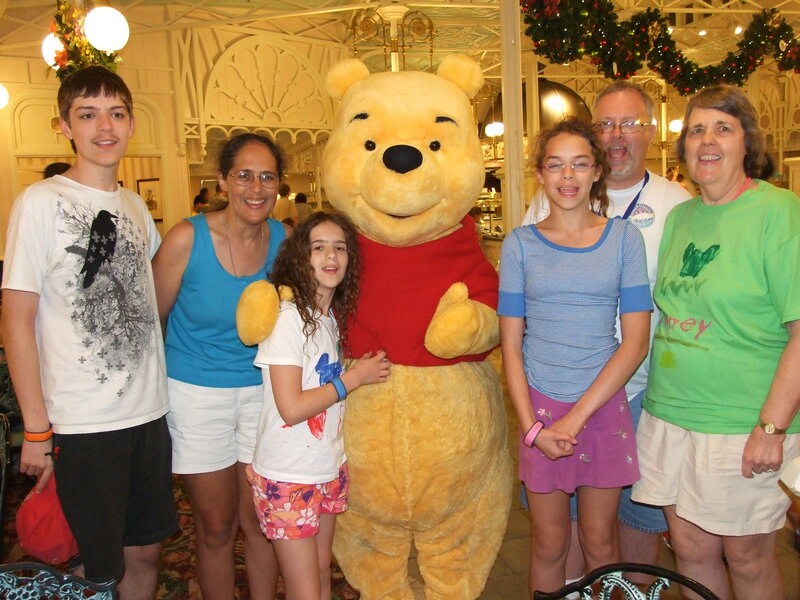 During our vacation to Walt Disney World, we experienced several different types of food. We had mostly good experiences and some that were a bit disappointing. Keep in mind that this is review comes from an everyday guy who only gets to visit Walt Disney World every few years or so. This means that my experience with Disney restaurants is very limited. And, we judge by how we find the meals to be during our visit. So, here we go! On our arrival day, my daughters and I went to Downtown Disney for a visit to the Earl of Sandwich. I had heard so many great things about the sandwiches here, that I had to try it! And, I had my birthday code with me, so I had a freebie coming to me. I got the Ham and Swiss with Honey Mustard Sauce, which I found to be delicious! My oldest daughter got the Chicken Caesar Salad and really enjoyed it. While my youngest daughter got the Best BLT and she raved about how good it tasted to her. In fact, we enjoyed this place so much, the whole family went back right before we had to head home. 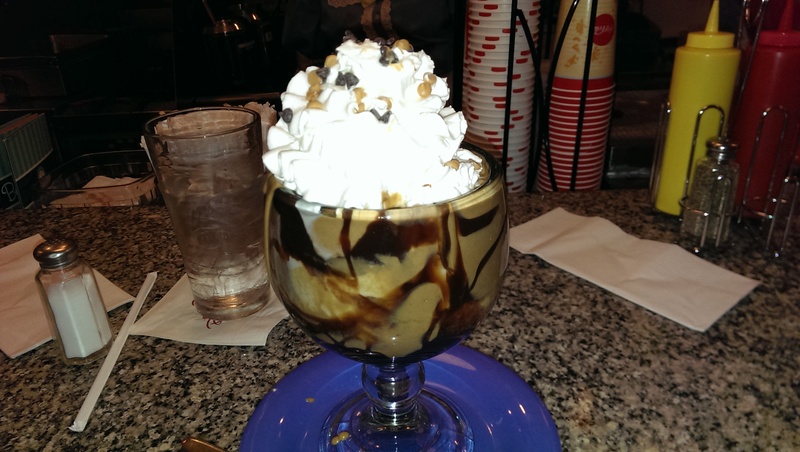 We then journeyed over the Disney’s Beach Club Resort for a taste of Beaches and Cream. My son attempted to take on The Kitchen Sink. He gave it his best effort, but in the end the Kitchen Sink won. My choice for the evening was the No Way Jose’. It’s a lot of peanut butter, but so very delicious! I did a pretty good job of taking care of the ice cream in my bowl. In case you haven’t heard, Beaches and Cream is now an Advanced Dining Reservation (ADR) selection. Keep that in mind! Fifteen-year-old vs. 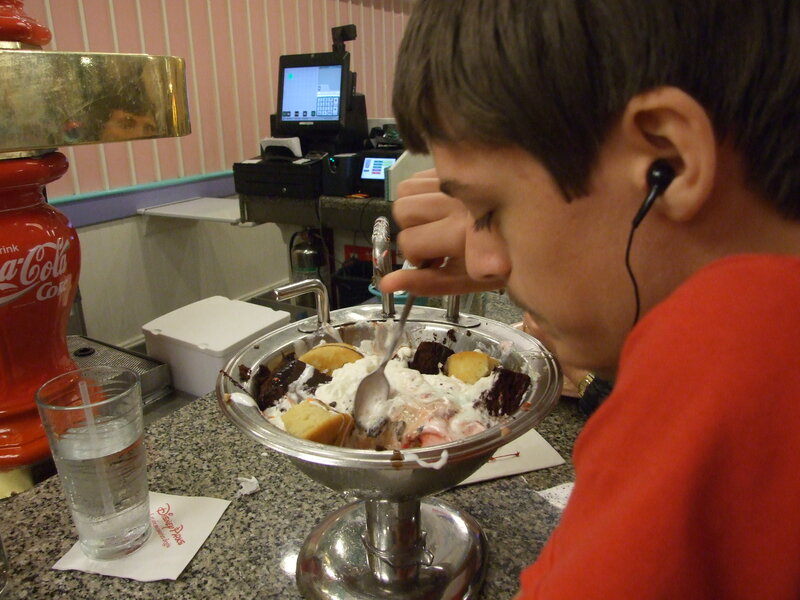 The Kitchen Sink at Beaches and Cream. For my birthday, December 5, we had dinner at the well-known ‘Ohana! I have to say that this meal was a bit disappointing. Not because of the food, but the service just wasn’t up to what we had experienced on our last visit. We were seated about 20 minutes late, which isn’t THAT big of a deal, but it took forever for our drinks to be served and there was a delay on serving food as there wasn’t enough ready. I will say, however, that once the food started getting to the table, it was an all-out feast! The only issue with the food was that I thought the pork wasn’t quite as tender as it should have been and a bit on the fatty side. While at Disney’s Hollywood Studio, we had dinner at Mom’s Place. I mean, 50s Prime Time Café. I enjoyed Mom’s Old Fashioned Pot Roast very much! The meat was fork tender and the potatoes were just a little lumpy the way mom used to make them. I tasted the Pumpkin Spice milkshake one of my daughters had and all I can say is YUMMY! That was a really good shake. There was some fried chicken on the table that looked spectacular and I believe a bit of salmon. The food was very well cooked, but again, the service wasn’t quite the level I expect when dining in a Disney restaurant. Next on our list was a surprise to us. After reading as much as I could about this restaurant, I wasn’t sure it was a good choice. But, with the addition of seats for The Candlelight Processional, it fit our schedule best. And, the dining experience I am referring to is…Nine Dragons at the China Pavilion. Many reviews don’t paint a flattering picture of the food or ambiance of this restaurant. Not only did we find it to be an excellent experience, but the food was very good! I would have to say that this was, indeed, our best meal on this vacation. My wife had the Kung Pao Chicken which had a spice that really took on a personality the longer it danced across the tongue. One daughter had the Honey Sesame Chicken and it had a sweet and slightly tangy taste to it. My other daughter and Mother-in-law had the Shrimp Fried Rice, but it’s not like the stuff you get down the street. This had jumbo shrimp and was served in a large bowl of fried rice. And my son and I enjoyed our Fragrant Five-Spiced Fish which became more delicious with every bite! The fish is slow pan seered to make sure that it is cooked through. The Five-Spiced Sauce is in a separate cup and can be used as a dipping sauce or poured over the fish. And, our server made this particular meal exceptionally enjoyable. We really liked Nine Dragons, and will revisit again in the future. At Disney’s Animal Kingdom, our main meal was Flame Tree barbeque. And, I have to say that it was exceptional barbeque! The sweet and spicy sauce really adds to the flavor of any of the meats you might decide to eat. The only difficult part is that all of the sit-down areas are outside and there were a lot of birds hanging close to the tables. May I recommend the Shredded Pork Sandwich? The meat was very tender and juicy, and when you add the sauce, it becomes one of the most delectable sandwiches on property. I got to take the Backstage Magic tour on our last day, which included lunch at Whispering Canyon Café. The meal was served in a family style and a few of the folks with me had special meal needs, so there was a lot of food to choose from. On the plate was shredded pork, bbq ribs, Italian sausage, bbq chicken, and mashed potatoes. Talk about down home barbeque! This stuff is really tasty, and the atmosphere of WCC is beautiful and has an open feel. You can find Whispering Canyon at Disney’s Wilderness Lodge. The time came to eat our final meal and our choice was The Crystal Palace in The Magic Kingdom. And, while the pricing is a bit on the high side, the character interaction with Winnie-The-Pooh and friends is not to be surpassed. The food was well cooked and had good flavor, the service was adequate, but the visits from the characters made this restaurant a highlight of our trip. Mrsthreestrandswdw may have more to add later! Well, that’s it for now. Have a Blessed and Magical Day! After completing my Backstage Magic Tour (see http://wp.me/p23hiG-9Q), I jumped on the Monorail from EPCOT to the TTC and then from TTC to The Magic Kingdom to join the rest of my family for one last go around. I love the personality of this park as day turns into night. Add to that the beautiful Christmas decorations and there is a WOW factor at work here! Christmas at The Magic Kingdom brings very beautiful floral arrangements. I headed straight to Storybook Circus to take a look at this area. I found the artwork and detail to be fascinating! Dumbo looks spectacular and so does the train station! The entire area looks like it would be a complete blast, especially with families that have smaller Disney fans. One report, though, tells me that Barnstormer is not as tame as it appears. From here, I moved over to the Fantasyland Expansion area to take a deeper look at some of the detail here, also. The Beast Castle really is a marvel! Gaston’s tavern is fun to look around, and the entire land is done in a fashion that Walt would be proud to call a part of his park. I would say the Imagineers really pulled this one off! Of course, the last piece isn’t open, yet. We shall see how the Seven Dwarf’s Mine Coaster affects things when it opens in the spring. I met up with the rest of my family and we headed off for another ride on Haunted Mansion. The line was long for this ride this evening with a posted wait of 30 minutes. And, I think it was a good 25 before we entered the stretch room. The ride was stopped for about 3 or 4 minutes, but once it got moving it was, indeed, a nice way to spend a few minutes. I love this ride! We were a bit late for our reservation at The Crystal Palace, but the Cast Member didn’t even blink. We were seated fairly quickly and then the Poohrade of Characters began. Yes, I agree that the cost of this meal is a bit high, but the interaction with characters is top-notch. My son found an extreme admirer when Eeyore came around. We kind of made a big thing about our son being an Eeyore at home, and maybe that was just the connection needed to forge this short-lived bond. The food was pretty good at the buffet and the service we good, as well. Not the best of our trip, but that will come along in a future report. I finished the night with a ride on the Tomorrowland Transit Authority. Can I say, it seemed like that thing was bookin around the open track with slow downs only while passing through attractions. Not the relaxing ride I have enjoyed previously. I’m sure they adjusted for the larger crowds to move people along. 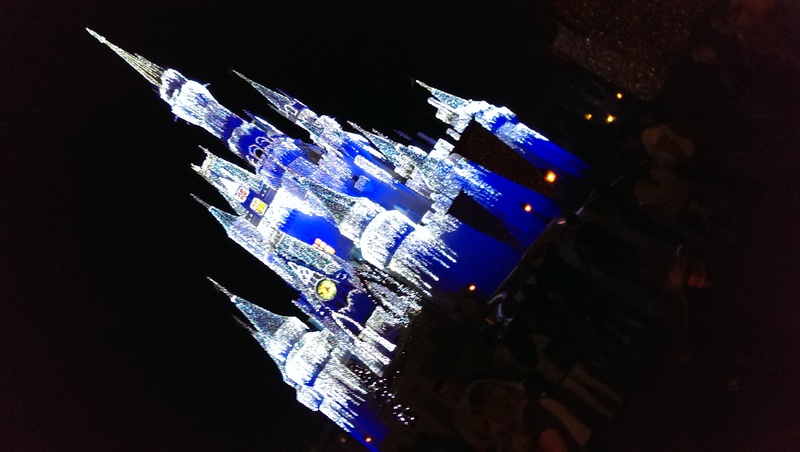 We watched Wishes! from the Tomorrowland area by Space Mountain. You can’t see everything, but the crowd in this area we manageable, making what we could see more enjoyable. 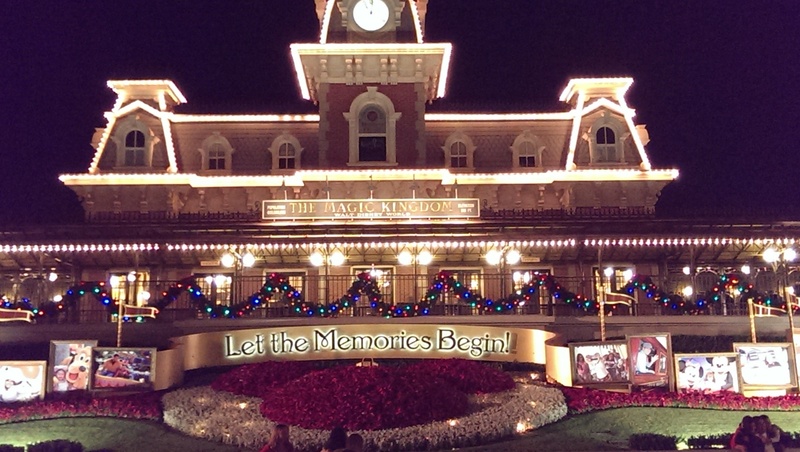 But, now it was time to find a spot for the Main Street Electrical Parade, so we headed up to Liberty Square. We found good seat near the Liberty Tree Tavern for viewing. It wasn’t as crowded as Main Street would be, which made viewing more enjoyable! And now, it was time for me to take in a last, deep breath of my sentimental favorite Disney park. So, I headed for the hub near Cinderella’s Castle, sat down, and just looked, listened, and smelled the atmosphere of this place that puts the biggest smile on my face. And, as usual, a few tears, too! It is my biggest hope, and most intense dream, to someday be a part of the magic that takes place here at the Walt Disney World Resort. I don’t know if it will ever happen, but I can continue to dream, can’t I? Blessings and magic be yours, today, my friends! !